When Ant-Man and the Wasp started production on the first of the month, with filming taking place in Atlanta and San Francisco, Marvel Studios released a brief teaser, along with a full cast list and a synopsis that revealed this sequel takes place, "in the aftermath of Captain America: Civil War," with Paul Rudd's character Scott Lang grappling with "the consequences of his choices as both a Super Hero and a father." As is the case with most Marvel synopses, it doesn't go into too great of detail, but we last saw Scott Lang imprisoned in a secret underwater prison known as The Raft, and it seems we may return to this mysterious location, if a new casting call is to be believed. There will be potential SPOILERS for Ant-Man and the Wasp below, so read on at your own risk. Omega Underground has uncovered a new casting call for "Cherry Blue," the working title for Ant-Man 2, where the production is seeking male actors to play both prisoners and prison guards. The production is seeking males of all ethnicities between 25 and 49 to play the prisoners, who should all have a "tough, rough convict look," and while tattoos are acceptable, they will require clearance from the studio. As for the prison guards, the studio is seeking males of all ethnicities between the ages of 30 and 49, who stand between 5'10" and 6'2" and are "lean/shaven." Actors will be needed for a shoot that will take place on August 31. While no specific details were given, it's possible that this movie could revisit The Raft prison, where we may get a look at Scott Lang in the prison before he was broken out by Steve Rogers (Chris Evans). Of course, we don't even know for sure that these prisoners and prison guards will be part of The Raft. They could be part of a totally differnent prison, but, since the last place we saw Scott Lang was in The Raft, at the end of Captain America: Civil War, it's probably a safe bet that these prisoners and prison guards will be part of The Raft. Also, since these actors will seemingly only be needed for one day, it doesn't seem like this will be a major sequence in the grand scheme of the film. 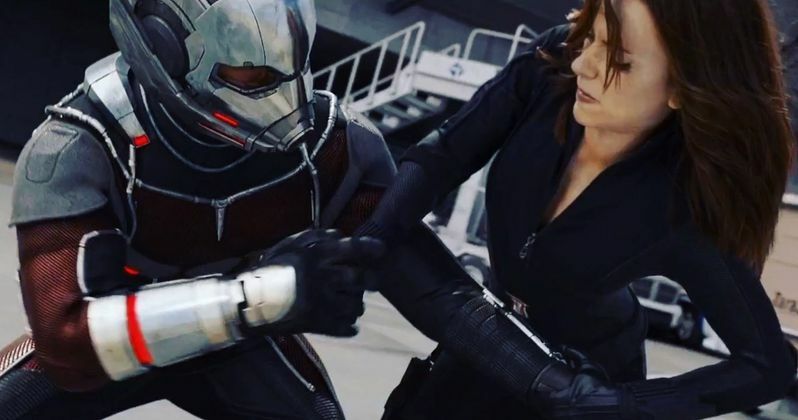 Marvel also recently confirmed the cast, with returning stars Evangeline Lilly (Hope Van Dyne/The Wasp), Michael Pena (Luis), Michael Douglas (Hank Pym), Bobby Cannavale (Paxton), Judy Greer (Maggie Lang), Abby Ryder Fortson (Cassie Lang), Tip "T.I." Harris (Dave) and David Dastmalchian (Kurt) all reprise their roles from the original. The highly-anticipated follow-up welcomes Academy Award nominees Michelle Pfeiffer as Janet Van Dyne, Hope's mother, Laurence Fishburne as Dr. Bill Foster, who, in the Marvel comics turns into Goliath, Hannah John-Kamen as Ghost, Walton Goggins as Sonny Burch and Randall Park as S.H.I.E.L.D. agent Jimmy Woo. It remains to be seen if the production will confirm any further cast members as shooting continues. There have also been rumors that Jeremy Renner's Hawkeye could make an appearance in this sequel, although that has yet to be confirmed, especially since he's still in production on Avengers 4, which just started filming today. Still, both movies are shooting in Atlanta, and given the memorable scene that Ant-Man and Hawkeye shared during the airport fight scene in Captain America: Civil War, it's certainly possible that these characters could in fact reunite. Hopefully we'll find out more about Ant-Man and the Wasp soon, as production continues and we get closer and closer to the July 6, 2018 release.